If you follow me on Instagram, you've seen all three of the photos from the post today. However, I liked them so much I just had to share them again. I think that it should be noted that as I write this, my dog is standing, sandwiched between my back and the back cushion of the sofa. For some reason, this is one of her favorite positions. Yesterday, my friend Sara and I made our second journey to Atlanta's Indie Craft Experience. After a battle with the GPS because downtown Atlanta and the GPS hate each other, we made our way into what can only be described as Etsy in real life. Pictured above, you can see the bracelet I had made by the lovely lady at Deadpan Days. At only $15, I think it was a total steal. 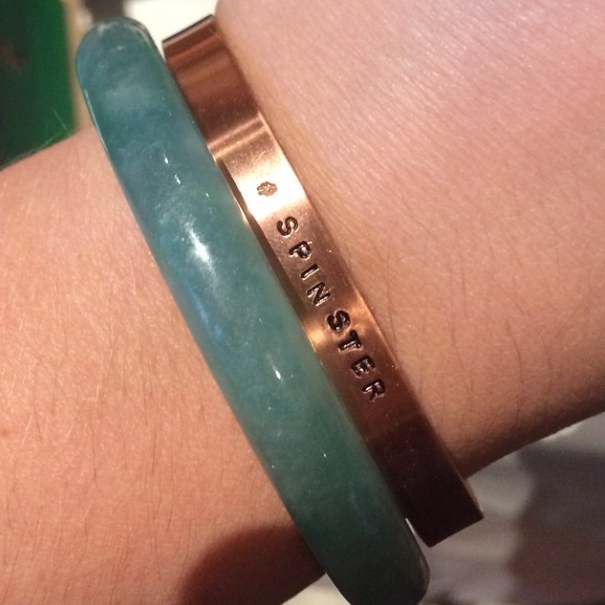 You can get her to make your bracelet say anything you want - and I do mean anything - as long as it fits. According to the cards I took, some of the other booths I liked very much included Katie Bush, Golda Kombucha, Be Good, Poppy and Fern (look really close at the items in this shop - they're embroidered cameos. I might need one. ), K.House, and of course Jimella's Bakery (I may need to place an order of those sandwich cookies for my birthday. Atlanta's Indie Craft Experience is still running today, so if you get the chance, you should brave the wilds of Downtown Atlanta and take a look! 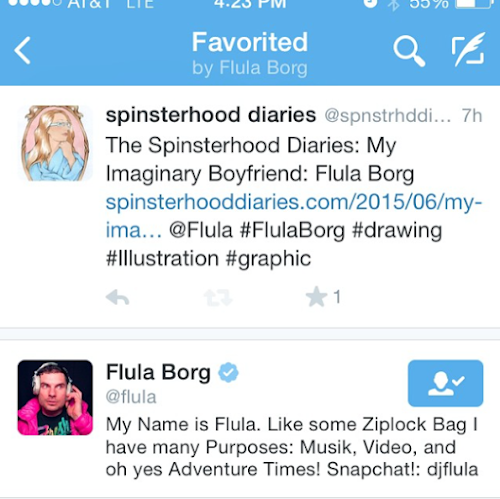 There's not much to say about this except that my imaginary boyfriend, Flula Borg favorited my tweet about yesterday's blog post, and it made my day. Now I almost feel like I should be going to VidCon just to see him (and hopefully see him perform??). Right. We'll see if that happens. Lastly, yesterday morning I went to the largest thrift store I have ever seen in my life. It's called Last Chance Thrift Store, and it's on North Decatur Road (There's also a smaller location (though still quite large) that I've been to in Chamblee...). 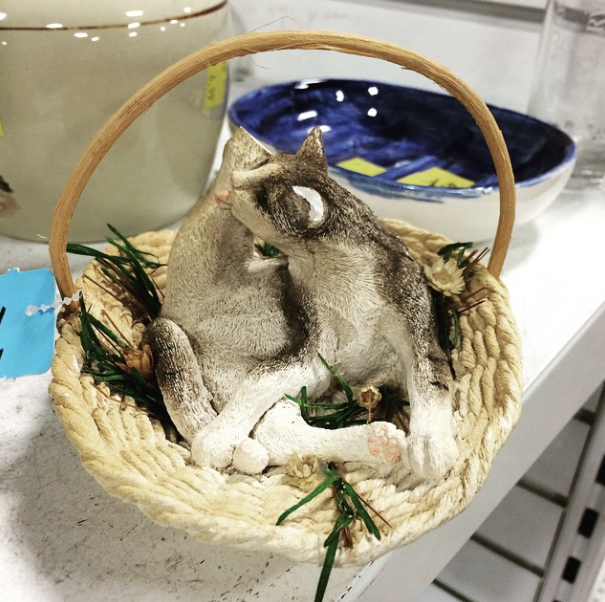 Among the gems in this metropolis of a thrift store, I found this bizarre little figurine. That's right. It's a cat cleaning itself, but I believe this particular cat is missing a foot. Despite missing its foot, though, how did this even get made? It seems somehow inappropriate. If you're in the Atlanta area, and you're looking to comb through the racks of a huge thrift store, I highly recommend this one. It's the biggest one I've ever seen, and every day they have a color-coded special. That's all for today! If you want to see more images of my spinsterly life, you can always follow me on Instagram: @Jonezee85. Happy Sunday!